In the Navy, Sonar Technician Surface Technicians (STGs) are a key part of what this branch of the U.S. Military does. They're responsible for underwater surveillance and help with navigation and search and rescue operations. Sonar is used by the Navy to detect, analyze, and locate targets of interest, so having qualified STGs to keep sonar systems and equipment in good operating condition is critical. Since sonar is used on surface ships such as frigates, minesweepers, destroyers, and cruisers as well as at remote locations throughout the world, there is no shortage of different types of work for these techs. 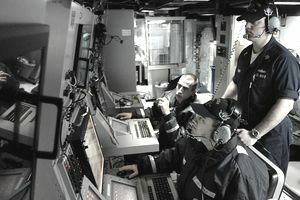 They'll operate sonar sensors for detection and classification of contacts, and operate underwater fire control systems. Sonar techs identify all manner of underwater sounds, including those produced by surface ships, torpedoes, submarines, evasion devices, jamming technologies, and other sonar transmissions (but including marine life and natural phenomena). Once they've collected data, sonar technicians will analyze and interpret it, preparing and maintaining charts and plots. Some of the specialized equipment they use include bathythermographs and fathometers, as well as other recording devices. Their training allows them to recognize major equipment malfunctions during sensor operations, perform preventive and corrective maintenance on sonar equipment and underwater fire control systems, and to identify electronic components on schematics and trace major signal flow. STGs usually work indoors in clean, shop like environments and computer equipment rooms. They work closely with others and require little supervision. Where Navy sonar techs go to training depends on which type of tech they're going to learn: surface, or submarine. For surface sonar technicians, they'll spend 10 weeks in "A" School in San Diego, after completing a six-week basic electronics course at the Great Lakes facility in Illinois. After that, they'll attend class "C" School anywhere from 27 to 58 weeks in San Diego. The STG rating (which is what the Navy calls its jobs) requires a four-year service obligation, and for those in the Advanced Electronics Field training, a total obligation of six years of service. For submarine class sonar technicians, a 37-week class "A" School training is required and takes place at the Navy facility in Groton, Connecticut. To qualify for this rating, sailors need a combined score of 222 on the Arithmetic Reasoning (AR), Mathematics Knowledge (MK), Electronics Information (EI) and General Science (GS) sections of the Armed Services Vocational Aptitude Battery (ASVAB) test. They need to be able to qualify for Secret security clearance and must have normal color perception and normal hearing. Sonar technicians in the Navy are required to be U.S. citizens.